Portugal Soccer Journals Always Bring a Smile! Softcover notebook, professionally designed lined lightweight journal makes a unique, gift idea for a Portuguese Fan. 2019 Grunge soccer ball with patriotic, love Portugal flag colors for Portuguese national at any game event. Motivational! Inspirational! Use as a writer's journal, office exchange party gift, or for the desk of any academic University or High School student. 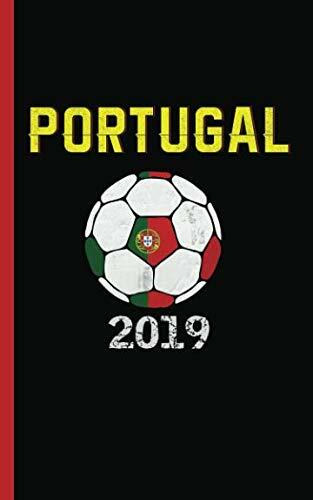 Works best for proud Portuguese heritage soccer player fan, coach sport trainer, or patriotic goalie child boy or girl. Makes a fun, great everyday notebook or back-to-school appreciation gift for a popular gym teacher or soccer coach anytime of the year. Perfect to record your travel memories, training thought quotes, lesson reminders, or success stories. Add your own note on the inside cover to make this a personalized gift for a boyfriend or girlfriend.